2007/11/salesforcecom_acknowledges_dat.html. 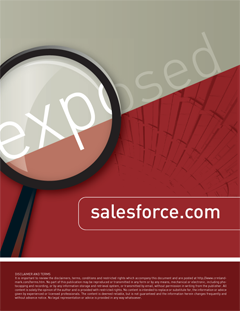 Since these incidents Salesforce.com appears to have taken proactive steps to address these issues and even added a portal, trust.salesforce.com, to provide a public view of data center availability and operations. Views into the portal during the creation of this document indicated one North American service center had difficulty for 7 hours due to an incorrect maintenance parameter. To further pacify the fears of potential customers Salesforce.com has also provided for users of the Enterprise edition and above, a real time database mirroring service. These customers also have access to a weekly export service (also available to Professional Edition users for a separate fee). Overall Salesforce.com has a comprehensive global data center infrastructure with data centers located in North America, Europe and Asia Pacific. In May 2008, Salesforce.com announced the creation of its first international data center in Singapore. The data center is expected to go live before the end of year and will support both Asia and North American customers according to statements made by Salesforce.com. It is uncertain at this stage whether the data centers will operate in an active-active fail-over mode. Salesforce.com is SAS 70 audited which may provide some comfort to SEC governed enterprises in the United States for their Sarbanes Oxley, section 404 compliance requirements. It also holds TRUSTe privacy, VeriSign Secured and a certification from auditors Ernst & Young. Surprisingly, Salesforce.com does not offer a standard Service Level Agreement (SLA) within its contractual subscription. It seems that in most cases only Salesforce.com’s larger or more influential customers are able to secure contractual SLAs. So, depending on the importance you place on application availability and uptime, it may be worth trying to determine from Salesforce.com exactly what commitments they are prepared to make before you sign the contract.